Wi-Fi Hotel designs, markets, installs and manages Wi-Fi network infrastructures for Internet access for any kind of facility open to the public. From bed & breakfasts to five-star hotels, our networks will let your guests connect. Fifteen years of experience, thousands of systems created and certifications for all the major Wi-Fi hardware manufacturers make us the leader in the Wi-Fi field for environments that are open to the public. Total coverage, maximum performance and easy management are the keywords for our systems. For the guests at any hotel or tourist facility, Wi-Fi never provides too much coverage. Wi-Fi Hotel’s systems are prepared to ensure extensive signal coverage throughout all the areas in your facility where you want to give your guests an Internet connection. The design phase for your network infrastructure allows the identification of the best equipment layout and configuration for each facility. Total coverage in all rooms and common areas, both indoors and outdoors. Guests who surf the web on any device with no trouble. Each Wi-Fi Hotel system is assembled to provide the best possible connectivity performance responding to each specific need of your facility. The hardware used to implement the networks is the product of a continued selection of equipment from the most important brands, striving for the best reliability and the greatest price-to-performance ratio. 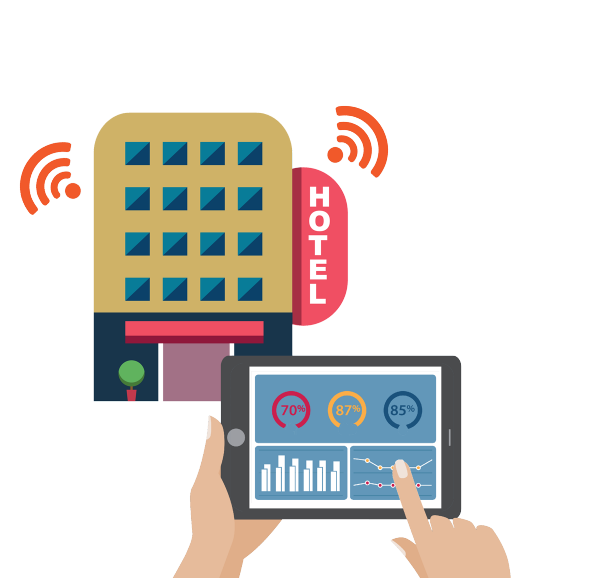 From the needs of major hotels to those of small tourist facilities, Wi-Fi Hotel systems can fulfil any kind of requirement or need in the way of connectivity for guests. A speed indicator placed above the wireless symbol. 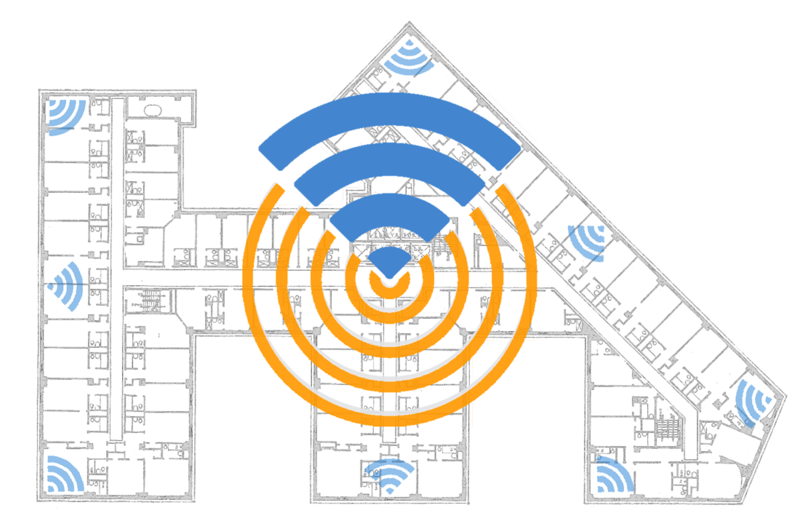 Wi-Fi Hotel means total control, not only of Internet connections, but also the equipment and access points that make up the wireless network of your facility. Assess network performance at any time. Perform complete check-ups on equipment status. Identify the presence of any unusual traffic. Find out the exact number of connections at that moment. Identify and precisely locate any problems within the network. Wi-Fi Hotel can meet any need related to Internet access in areas open to the public, by supplying, installing and maintaining Wi-Fi hotspot systems for hotels and tourist facilities of any kind. Wi-Fi Hotel gives you the most freedom of control over your system, without the typical burdens of managing infrastructure from a provider. This way, you can manage completely independently every feature of your facility’s connectivity, choosing which access methods to make available to your users. You own your Wi-Fi system, and the whole network infrastructure is externally monitored, with very high uptime guaranteed. We avoid placing ‘critical’ hardware components at the facility, which could increase the risk of a possible breakdown. 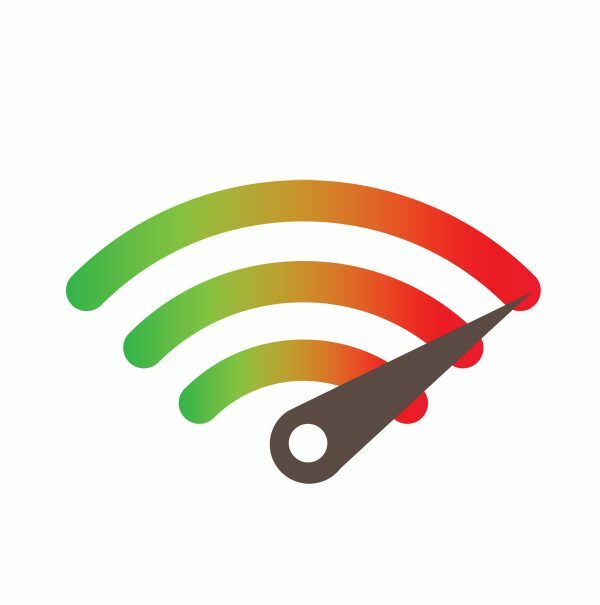 This is why choosing Wi-Fi Hotel means getting the best wireless system for hotels on the market, both in terms of quality and the way we provide it. 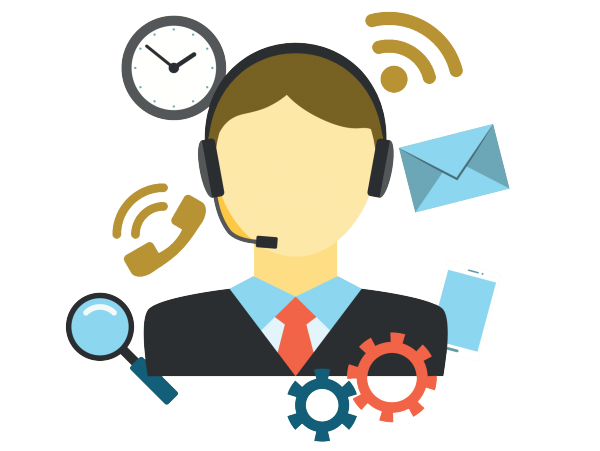 Wi-Fi Hotel’s professional technical support features various levels of service, chosen by the facility according to its needs. From basic support (available during normal weekday work hours) to top-level assistance (24 hours a day, 7 days a week), we perform remote monitoring in real time for every Wi-Fi Hotel system, notifying clients of any malfunctions and taking measures if there are breakdowns. 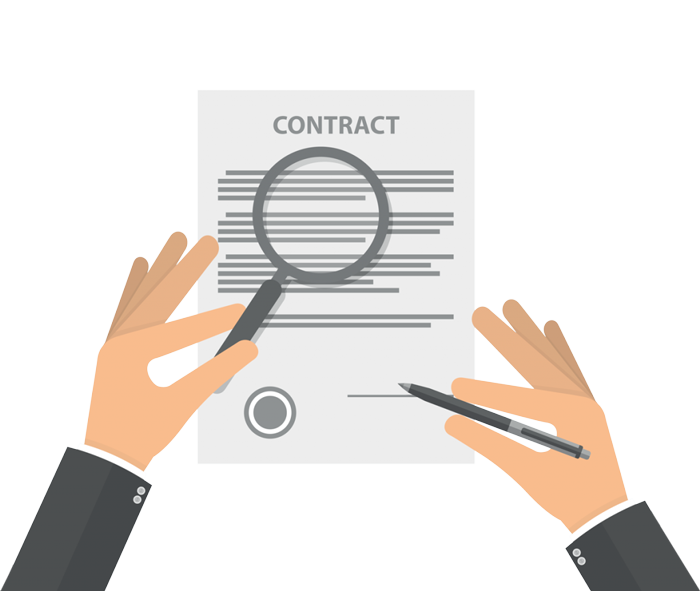 Additionally, if requested, we can perform on-site work doing pre-installation inspections, training facility staff on managing the system after every installation or other technical operation. Wi-Fi Hotel’s support also means making it fast and easy to resolve any technical problem in your wireless system. Because of this, all the equipment provided in our installations have a lifetime guarantee. Furthermore, Wi-Fi Hotel does early replacement (‘quick replace’) of failed components, sending new, pre-configured equipment by courier by the next work day after diagnosing the problem. Maintaining the wireless network with a router. Wi-Fi Hotel is fast and easy, even when it comes to installation. On average, a complete installation lasts less than a day. Using Wi-Fi technology and next-generation cabling, our staff can set up a complete wireless infrastructure in your hotel and get it running in a short time with no trouble, either for you or for your facility. 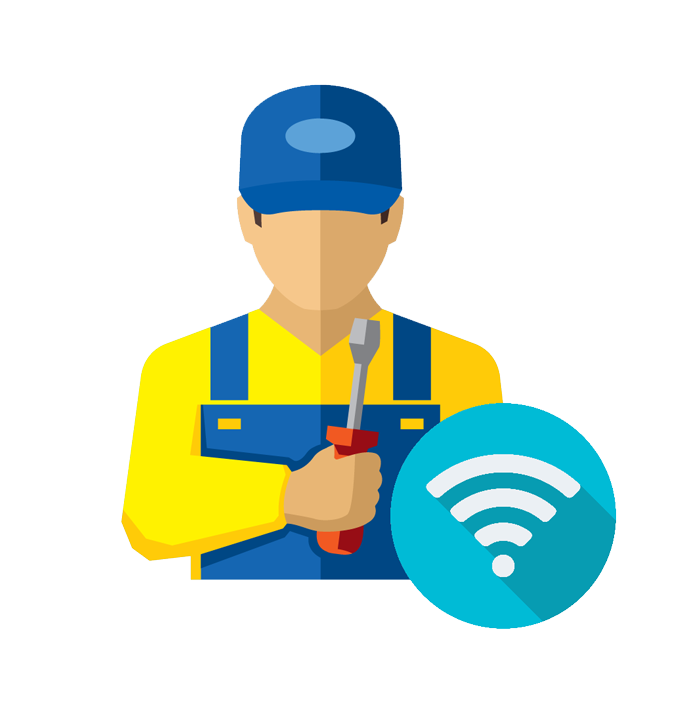 To optimise your results, we prepare for each Wi-Fi Hotel system installation by writing a complete technical specification that is tailor-made by assessing layout of the facility and possibly performing an ‘on the field’ inspection and survey. This way, we can identify and prepare in detail all the operations needed to activate the system, to allow your guests to get on the Internet in the shortest time possible. 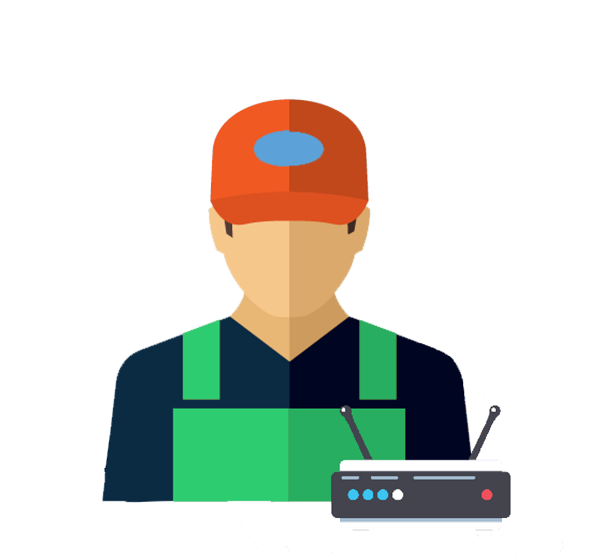 Do You Want to Install or Upgrade a Wireless Network at Your Facility, and Do You Want All the Details? Request a No-Obligation Quote!